Downhill Barbie Jeep Racing is Sketchy and we Love It! 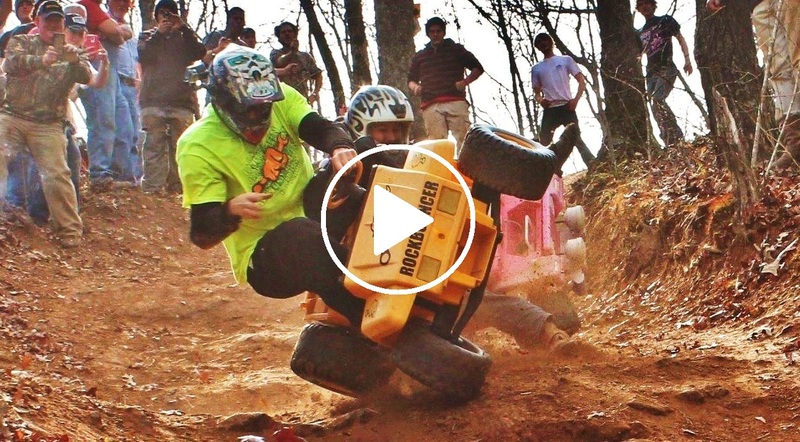 There is nothing like the high speed mayhem that is Extreme Downhill Barbie Jeep Racing. For the 2012 Race we came to Morris Mountain ORV Park in Delta, Alabama where they have one rough and fast hill. Many brave or crazy drivers loaded up their plastic chariots of doom to see if they had what it takes to be the best at the annual RBD event. The Hill was a rough rutted out bypass trail for the popular Los Primos 4×4 trail. It features two turns that made for some spectacular crashes with plastic car parts flying everywhere. These junk barbie jeeps where pulled out of dumpsters and off the side of the road and given a new life. We tear out the electric motors and batteries and make the tires spin freely allowing gravity to do the rest. Our 2012 event had some great crashes and some close finishes with a large crowd cheering us on. Extreme Downhill Barbie Jeep Racing has to be one of the best bang for the buck extreme sports out there. Anyone can find and race a barbie jeep. You just need a hill, a jeep, and a helmet. It is however a dangerous sport and sometime people get hurt. Ben Bone had one of the worst crashes of the day when his FJ Cruiser got side ways throwing him into a tree cracking his ribs. This is one of the few events that I (Busted Knuckle) did not win. JD Taylor put me out in the semi finals aboard a John Deere Gator. He then battled it out with Gillis Coleman in the finals resulting in an epic photo finish. Check out the Video to see who took home the win. For More Extreme Downhill Barbie Jeep Racing Check out the Busted Knuckle Video Youtube Channel. Check out the Full Video from the 2015 Downhill Barbie Jeep Racing Event.